Neither drugs nor alcohol appeared to play a role in the car accident that seriously injured former FBI Director Louis Freeh, the Burlington Free Press reports. Freeh, 64, of Wilmington, Del., remains in serious condition at the Dartmouth Hitchcock Medical Center in Lebanon, N.H. where he’s being protected by armed guards. The accident happened Monday when Freeh’s 2010 GMC Yukon veered off a rural stretch of road in Vermont. Investigators found no evidence of brake marks or skids. 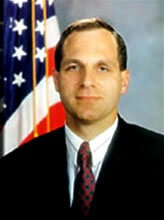 Freeh was traveling alone and wearing a seatbelt. Posted: 8/27/14 at 9:39 AM under FBI, News Story. Does anyone proof the stories before they are posted?? What does the phrase’ ” …he is armed by guards” mean? That comment seems to imply that guards have provided Mr. Freeh with firearms as he is lying in his hospital bed. I doubt if that’s the case. I presume that the writer intended to state that Mr. Freeh has an armed bodyguard detail that is protecting him as he recovers, but perhaps Mr. Neavling has a real scoop. here.